After processing at a water treatment facilities, which the City of New York’s DEP manages 14 of (including the vast Temple of Cloacina called the Newtown Creek Wastewater Treatment Plant), the concentrated sludge distillate produced by municipal sewage plants requires “dewatering” – it must be reduced into a semi solid called “cake”. Not every one of the 14 wastewater treatment plants has a dewatering facility, so the sludge needs to get from point A to point B via a the fleet of Sludge Vessels. Pictured above is the sludge dock in Greenpoint, with the M/V Red Hook at dock, at the mouth of the Newtown Creek. Flowing from that aforementioned temple of “the Venus of the Sewers” to a gigantic holding tank via mechanical means, it is then pumped out to the dock and the waiting sludge boat. Several stories underground, wastewater flows into the plants from sewers connected to New York City’s homes and businesses. The incoming wastewater, called influent, passes through screens consisting of upright bars, spaced one to three inches apart. These bars remove large pieces of trash including rags, sticks, newspaper, soft drink cans, bottles, plastic cups and other similar items. This protects the main sewage pumps and other equipment. The garbage is transported to landfills. The main sewage pumps then lift the wastewater from the screening chamber to the surface level of the plant. The degritted primary sludge is pumped to the plant’s sludge handling facilities for further processing. The partially treated wastewater from the primary setting tanks then flows to the secondary treatment system. The 1.3 billion gallon a day flow of New York City’s sewage should be defined as a third river. That’s 1,300,000,000 gallons a day or 474,500,000,000 gallons of night soil a year. 1.3 billion is the population of China. 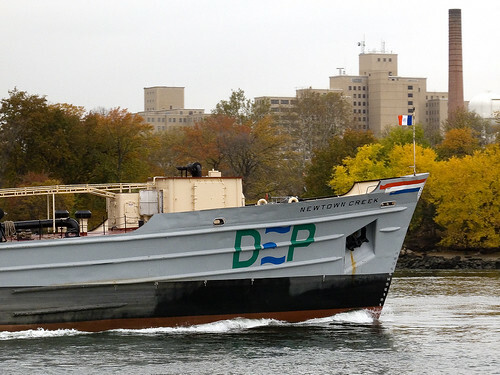 Pictured above is the DEP Sludge Vessel M/V North River, a veteran, she was launched at Maryland Shipbuilding in 1974. Just under 324 foot long, North River can carry 102,000 cubic feet of evil juice and weighs in at 2,557 gross tons. 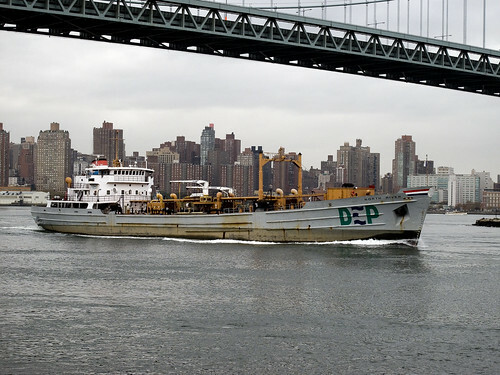 Identical in dimension and capacity to the North River, the 1967 vintage DEP Sludge Vessel M/V Newtown Creek passed under mighty Triborough and crossed Hells Gate. M/V Newtown Creek was laid down by the Wiley Manufacturing Co. Back in the days of ocean dumping, these ships were amongst a small fleet of tugs, barges, and older sludge boats that would “do the deed“. Methane gas is often used as an energy source at the City’s wastewater treatment plants. The gas may be used in engines to produce electricity or directly drive plant equipment. Gas is also used in boilers to provide heat for digestion and plant-wide buildings. Currently, DEP and the New York Power Authority (NYPA) have jointly installed fuel cells at four of the City’s water pollution control plants; 26th Ward, Red Hook, Oakwood Beach and Hunts Point. Fuel cells convert the methane gas and carbon dioxide into heat and electricity that is then used to operate the plants. This technology contributes to New York City’s efforts to enhance clean air operations at its facilities. There is a significant reduction in air emissions as a result of using fuel cells. Digester sludge is pumped from sludge storage tanks to a dewatering facility. At some treatment plants, where there are no dewatering facilities on site, the sludge is transported for processing through a pipeline or by a sludge boat to a plant that has a dewatering facility. Once requiring a crew of as many of 20, the City now runs these ships with a mere 6. 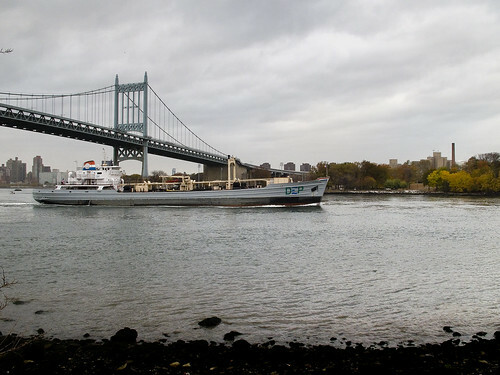 Semiautomated, M/V Newtown Creek and North River are nevertheless more than twice the size of the original model Sludge Vessels like the Owl’s Head. Dewatering reduces the liquid volume of sludge by about 90%. 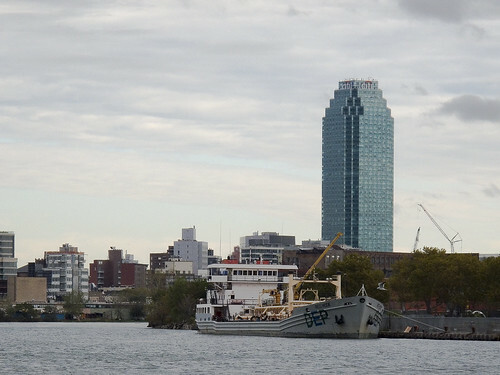 New York City operates dewatering facilities at eight of its 14 treatment plants. At these facilities, digested sludge is sent through large centrifuges that operate like the spin cycle of a washing machine. The force from the very fast spinning of the centrifuges separates most of the water from the solids in the sludge, creating a substance knows as biosolids. The water drawn from the spinning process is then returned to the head of the plant for reprocessing. Adding a substance called organic polymer improves the consistency of the “cake”, resulting in a firmer, more manageable product. The biosolids cake is approximately 25 to 27 percent solid material.